Join our APM PMQ | APM Project Management Qualification training course at Southampton, Hampshire. Get an APM PMQ project management qualification. This is a knowledge based qualification covering the 12 core elements of project management. By the end of the course you will be able to demonstrate an understanding of how these elements interact and how your projects fit into your strategic and commercial environment. The nationally and internationally recognised PMQ gives you a qualification that can be carried from one job to another or from one industry to another. The PMQ qualification is the perfect choice for those wishing to achieve a broad level of project management knowledge sufficient to participate in projects from individual assignments through to large capital projects. It would be beneficial to have been working in a project environment for 2 years or more. Any others for whom projects represent a significant proportion of their activity. If your role is not on the list above but you would like a career in project management, then please consider attending our PFQ course prior to the PMQ. It would also be of benefit to gain some work experience in project management before you undertake the PMQ. If you would like to discuss your circumstances then please don’t hesitate to contact us. Should you take the PMQ or PFQ? Facts about the PMQ course. Download and complete our PMQ self assessment spreadsheet. Attempt all questions, scoring your answer with either 1, 2, 3, 4, 5. If your overall average score is greater than or equal to 2.5 it would indicate you’re ready to undertake this project management qualification. It’s a guide for you, and if you have any questions please contact us. There will be homework each night with questions relating to the topics covered during the day. Please set aside enough time to answer the questions in the time you’ve been given. The 3 hour PMQ exam answers need to be handwritten, therefore, it is a good idea to start writing again in preparation! One tip is to re-write the APM book of definitions. For more detailed tips about the exam please go to our PMQ exam tips and advice pages. Our courses are structured but informal. Dress code is smart casual. During the course you will be encouraged to ask questions and join in discussions – the more you are involved the more you will gain. There will be a maximum of 12 delegates on your course. A recent PMQ course at the IPSO FACTO training centre, M27, J9, Fareham, Hampshire. If you have four or more delegates who need this or any of our other courses; we can offer a tailored solution to meet your needs. Courses can be held at one of our training venues or on-site using a suitable room. We can provide all equipment and training materials and this is a cost effective way to deliver your training. Please contact us for more information. Lunch and refreshments – let us know if you have any special dietary needs. On receipt of payment we will post pre-course reading material to prepare you for the course, and include joining instructions and a video link of how to find us. PMQ exam tips – Improve your chances of passing the PMQ exam. PRINCE2 or PMQ – Differences between the two courses. APM Qualifications – Which qualification is right for you. payback, Internal Rate of Return and Net Present Value as investment appraisal techniques. Is the APM Project Management Qualification (PMQ) right for you? 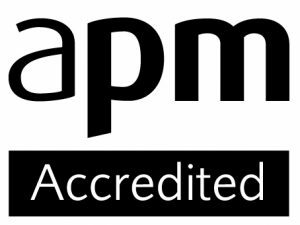 PMQ is the second step in the progressive suite of qualifications brought to you by the Association for Project Management (APM) the Chartered body for the project profession. Video’s about the APM Project Management, PFQ and PMQ accredited courses.